P. de Maerel, by whom acquired directly from the artist in October 1961. Private collection, Switzerland, by whom acquired from the above circa 1975. Private collection, Monaco, by whom acquired from the above circa 2002. Panorama, Antwerp, 10 - 16 December 1963 (illustrated p. 26). The ARTgallery, Ivoryton, January 1964 (illustrated p. 6). H. Torczyner, L'ami Magritte: correspondance et souvenirs, Antwerp, 1992 (letters nos. 202, 203, 205 and 210). D. Sylvester (ed. ), René Magritte, Catalogue raisonné, vol. III, Oil Paintings, Objects and Bronzes, 1949-1967, Antwerp, 1993, no. 936 (illustrated p. 351). New York, Museum of Modern Art, René Magritte, December 1965 - February 1966, no. 77; this exhibition later travelled to Waltham, MA., Rose Art Museum, Brandeis University, April - May 1966; Chicago, Art Institute, May - July 1966; Pasadena, Art Museum, August - September 1966 and Berkeley, University Art Museum, October - November 1966. Geneva, Musée Rath et Cabinet des Estampes, Art du XXe siècle - Collections genevoises, June - September 1978, no. 116. Lausanne, Fondation de l'Hermitage, René Magritte, June - October 1987, no. 108. Munich, Kunsthalle der Hypo-Kulturstiftung, René Magritte, November 1987 - February 1988, no. 102. Barcelona, Fundación Juan March, Magritte, January - April 1989, no. 53 (illustrated p. 113). Looming dominant upon the canvas as though monumental within their own small world, two masked apples appear to consort together in a barren landscape. Despite the fact that all of the elements in Le prêtre marié, painted in 1961, exist in the real world, and indeed despite the fact that one could place a mask on an apple, there is nonetheless a distinct atmosphere of strangeness about this picture. Where is the tree from which these fruit could fall? These apples appear to be on a beach, a crescent moon above them in a surprisingly day-like sky, sand stretching behind them. There is both tranquillity and menace in the scene, which is clearly dominated by the masked fruit. They appear to be interacting in some manner. Despite the fact that there are no eyes behind the masks, this anthropomorphising element succeeds in implying an intelligence to the apples that is accentuated by Magritte's deft depiction of the slightly jaunty angle at which they perch, as though eager and aware. These fruit appear engaged in some form of furtive conversation, or are perhaps waiting... Are they lovers, criminals in disguise, highwaymen, Scarlet Pimpernel-like characters, or are they going to a masquerade ball? The dashing cavalier aspect of the masks is humorously off-set by the sad nibbling by caterpillars to which their plumage has been subjected, adding a slightly tatty air to these dandyish fruits. Masks, disguises, hidden faces-- all these are repeated motifs in Magritte's pictures. Whether it is in the images of lovers from the 1920s, with sheets covering their kissing heads, the figure of Fantômas in Le barbare or later the apple floating in front of the artist's own face in Le fils de l'homme, these elements introduce a notion of the malleability and illegibility of character, of identity, of selfhood, of life. They are elements used to hide, but also to entertain. They are the accoutrement of the criminal and the actor alike, and in both cases conjure a vivid theatricality. But be it upon the stage or on a moonlit night in the middle of nowhere, these masks are unsettling, as they hide information. They introduce subterfuge, be it in the leisurely suspension-of-disbelief context of the stage or in the more disturbing context of someone concealing their own identity. In Le prêtre marié, the masks actually appear to perform almost the opposite function of some of those other works-- where on human figures, masks and other elements remove any possibility of identification, and thereby remove some of the humanity of the subject, here the masked apples are lent a suspicion of impossible humanity by their masks. They in fact gain character, becoming entertaining, even rakish figures on the beach, rather than mere abandoned fruit. It is through the inclusion of the masks that all our questions emerge, all the implications of possible back-stories that make these apples so intriguing. This simple adornment, added to an inanimate object, dispels the literalness of the scene and introduces a wild card, a joker, an element of unpredictability that engages the viewer actively, presenting the apples as intriguing mysteries that are of course impossible to solve. There is a strange tension between the pair, as though their relationship cannot be consummated. The stillness of two apples placed side by side becomes, in the Surreal vision of Magritte, a question of personality, of romance, of implication. This stillness adds so much to the picture's impact, yet it is all the more ingenious a weapon in the artist's arsenal because it belongs firmly within the conventions of the nature morte. Magritte has deliberately used this subject in order to engineer a collision between various traditional genres of painting. This is at once landscape, with the apples dwarfing the horizon and dominating the canvas like mountains; it is still life; and crucially, it is portrait. Magritte has managed to mix all these genres and categories to create something that is both entertaining and disturbing, that begs us to question reality, and also to question art and the nature of representation. The masked apple originally appeared in Magritte's work as the design for a cover for an edition of View, published in December 1946. Other covers for View had been designed by artists as diverse as Joseph Cornell, André Masson and Marcel Duchamp. Clearly, Magritte was pleased with his image, as he returned to the theme of the masked apple in several paintings over the following decade and a half, exploring various compositions and variations. 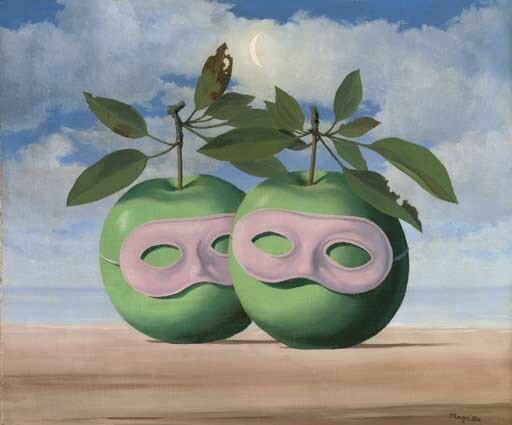 In Magritte's, the masked apple is a dynamic character, shown against a vivid, shimmering background. This added a sense of movement that Magritte has deliberately dispelled in Le prêtre marié, where the stillness is both unnatural and, of course, in the case of the apple-subjects, entirely natural. The first owner of Le prêtre marié was Peter de Maerel, the director of the American office of Sabena, who owned a selection of works by his compatriot, Surrealist artists Paul Delvaux and René Magritte. It was indirectly through de Maerel that Magritte met, in 1957, the man who would become his so-called 'ambassador,' Harry Torczyner, an international lawyer, ex-patriot Belgian and great collector who also published several books on the artist. De Maerel's sister had asked Torczyner to visit Magritte to pick up a picture for her, and this led to the first of several meetings and the beginning of an important friendship. The history of Le prêtre marié itself reflects the history of the friendship between all three men. Magritte had been asked by de Maerel for a painting of masked apples, which accordingly the artist executed. However, he became attached to the picture, writing to Torczyner that he hoped the prospective buyer would not come: 'let us wait you and I until he expresses a desire to have them: I would just as soon he forgot about the picture and that it stayed with me' (Magritte, quoted in D. Sylvester (ed. ), op. cit., p. 352). Magritte was clearly attached to this picture, but was soon disappointed to find that his trustworthy ambassador had in fact told de Maerel, against the artist's wishes, about the picture-- and that the latter had been to collect it: 'No tragedy involved,' commented Magritte subsequently, 'but a 'diplomatic' question-mark addressed to my ambassador' (Magritte, quoted in ibid., p. 352).